Improved version of the Ariane 1. It featured increased thrust first and second stage engines, a 25% stretched third stage, 4 seconds specific impulse improvement in the third stage, a larger internal payload fairing volume, and introduced the Sylda payload carrier for dual payloads. The Ariane 3 version added two solid rocket motor strap-ons. Development was authorized in July 1980 and had a total cost of 144 million 1986 Euros. Status: Out of production. Payload: 2,580 kg (5,680 lb). Thrust: 5,060.40 kN (1,137,623 lbf). Gross mass: 248,300 kg (547,400 lb). Height: 52.00 m (170.00 ft). Diameter: 3.80 m (12.40 ft). Payload: 2,580 kg (5,680 lb) to a GTO, 7 deg. Launch Price $: 42.500 million in 1987 dollars. Stage 0. 4 x Ariane 3-0. Gross Mass: 9,663 kg (21,303 lb). Empty Mass: 2,313 kg (5,099 lb). Thrust (vac): 689.990 kN (155,116 lbf). Isp: 263 sec. Burn time: 29 sec. Isp(sl): 240 sec. Diameter: 1.07 m (3.51 ft). Span: 1.07 m (3.51 ft). Length: 8.32 m (27.29 ft). Propellants: Solid. No Engines: 1. Engine: SPB 7.35. Other designations: SPB 7.35. Status: Out of Production. Stage 1. 1 x Ariane 2-1. Gross Mass: 160,030 kg (352,800 lb). Empty Mass: 13,750 kg (30,310 lb). Thrust (vac): 2,879.997 kN (647,449 lbf). Isp: 281 sec. Burn time: 140 sec. Isp(sl): 248 sec. Diameter: 3.80 m (12.40 ft). Span: 8.30 m (27.20 ft). Length: 18.40 m (60.30 ft). Propellants: N2O4/UDMH. No Engines: 4. Engine: Viking 2B. Other designations: L-140B. Status: In Production. Stage 2. 1 x Ariane 2-2. Gross Mass: 37,130 kg (81,850 lb). Empty Mass: 3,625 kg (7,991 lb). Thrust (vac): 804.998 kN (180,971 lbf). Isp: 296 sec. Burn time: 125 sec. Isp(sl): 210 sec. Diameter: 2.60 m (8.50 ft). Span: 2.60 m (8.50 ft). Length: 11.50 m (37.70 ft). Propellants: N2O4/UDMH. No Engines: 1. Engine: Viking 4B. Other designations: L-33B. Status: In Production. Stage 3. 1 x Ariane 2-3. Gross Mass: 12,000 kg (26,000 lb). Empty Mass: 1,600 kg (3,500 lb). Thrust (vac): 62.703 kN (14,096 lbf). Isp: 446 sec. Burn time: 731 sec. Diameter: 2.66 m (8.72 ft). Span: 2.66 m (8.72 ft). Length: 11.53 m (37.82 ft). Propellants: Lox/LH2. No Engines: 1. Engine: HM7-B. Other designations: H-10. Status: In Production. Stage 4. 1 x Mage 2. Gross Mass: 530 kg (1,160 lb). Empty Mass: 40 kg (88 lb). Thrust (vac): 45.483 kN (10,225 lbf). Isp: 293 sec. Burn time: 44 sec. Diameter: 0.77 m (2.52 ft). Span: 0.77 m (2.52 ft). Length: 1.52 m (4.98 ft). Propellants: Solid. No Engines: 1. Engine: Mage 2. Status: Out of Production. Family: orbital launch vehicle. Country: France. Engines: HM7-B, Viking 2B, Viking 4B. Spacecraft: Spacebus 100, ECS/OTS, HS 376, Insat 1, AS 3000, Intelsat 5A, Spacebus 300, Eurostar 2000, Olympus. Stages: Ariane 3-0 P7.35, Mage 2. Agency: Les Mureaux. 1980 July - . LV Family: Ariane. Launch Vehicle: Ariane 2/3. 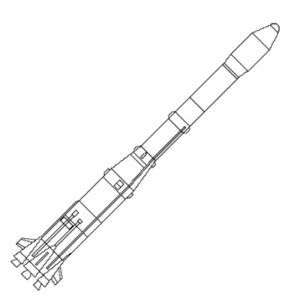 Development of Ariane 2/3 launch vehicle authorised. - . Nation: France. The upgrade to the Ariane 1 had a total cost of 144 million 1986 ECU's..